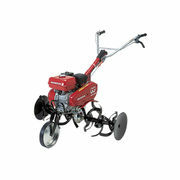 The durable Honda F501 tiller is lightweight and easily manoeuvrable translating to easier use and transportation. Powered by Honda's reliable GX160 engine this tiller is equipped with two forward and one reverse gear making tilling so much easier. The wide 9.1cm tine width is ideal for larger areas making light work of big jobs, designed to tackle heavy-duty tasks. 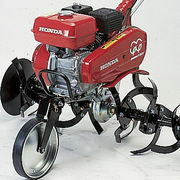 While the tine width is very generous this Honda tiller is still simple to move making it ideal for fence lines and veggie patches in confined areas also. Safety is one of Hondas strongest areas meaning which is shown through the application of a dead man clutch for added safety. Carrying Honda's reputation of starting first time, every time this machine will be something that you will know you can trust. Its quiet engine and low emissions operation also means that this tiller won't disturb people nearby. 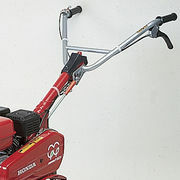 Honda's revolutionary 4-stroke engines are the foundation of the companies reliable and dependable reputation and the GX160 used in this tiller is where it all started. Featuring auto-decompression, anti flood primer system and electronic ignition this tiller is designed to last the distance. 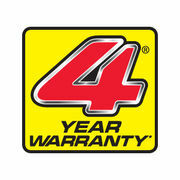 That is why it is backed by Honda's 4 year domestic warranty, which is one of the biggest in this area showing you the confidence Honda has in their machine. Be confident in your purchase, and buy a Honda.